You don’t need to be wealthy to own an iPhone but to be able to spend money on a case that costs nearly twice as much as the phone itself means you’re living the life of luxury. These Louis Vuitton cases can be had at the signature Manhattan 5th Ave. store starting tomorrow for the low price of $225 for the staple monogram case. Expensive, yes, but doable for most. After all, that iPhone did set you back $500 or $600 plus tax. However, for those of you with Astons, Ferraris, and a nagging wife, there’s the ultimate iPhone case. 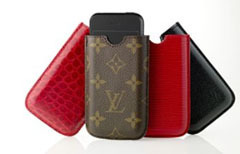 Constructed from alligator skin and dyed in a breathtaking red coloring, this luxury case goes for a whopping $1120. Yes, to protect your iPhone in style, you must pay for a case that costs more than two iPhones. Rediculous, but totally understandable. Someone has to cater to the elite and who better to do it than Louis Vuitton?